Cypress, CA – September 6, 2017 – Yamaha Motor Corporation, USA, today introduced the all-new 2018 Star Eluder motorcycle, adding a bagger model to the company’s transcontinental touring line-up. Drawing from the recently-introduced 2018 Star Venture, the Star Eluder is powered by an air-cooled 113 cubic inch (1854cc) V-twin fuel-injected engine, and features “Drive Mode” settings that adjust throttle response, traction control, a heated seat for the rider and passenger, a fully-featured infotainment system and more. 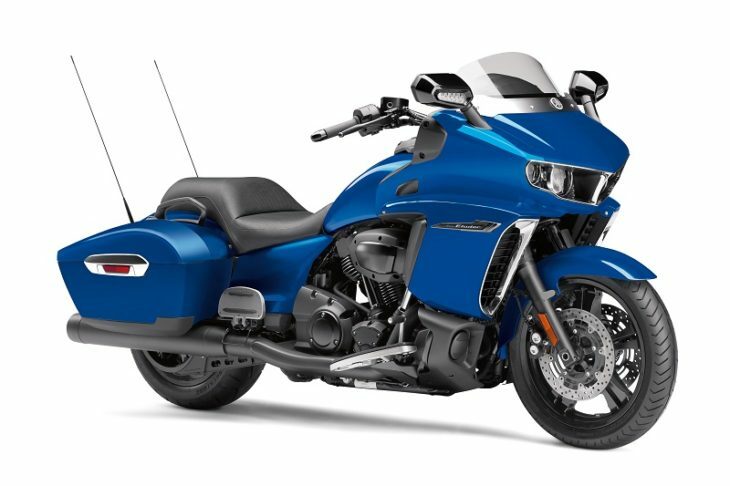 Together with Yamaha’s renowned quality, performance and reliability, these features combine to make the Star Eluder the most technologically advanced V-twin bagger motorcycle with the perfect balance of modern features, design and emotional character. Yamaha’s Chip Controlled Throttle (YCC-T®), a ride-by-wire throttle control system, converts the rider’s grip input into calculated throttle control providing precise and refined responsiveness. Yamaha D-Mode allows the rider to choose from two different throttle response settings – an ultra-smooth touring mode, and a sport mode for sharper response. The traction control system helps prevent wheel spin when dealing with reduced-traction road conditions, and a finely-tuned cruise control system also comes standard on the Star Eluder providing for comfortable cruising with improved fuel economy. To find out more about the Star Eluder, visit https://www.yamahamotorsports.com/transcontinental-touring/models/2018/star-eluder. A full range of Genuine Yamaha Accessories for the new Star Eluder can be found at https://www.shopyamaha.com. More information on all Yamaha products can be found at https://www.yamahamotorsports.com. I thought air scoops this big went out with Buell! And it resonates the Kawasaki Vaquero a bit too much as well. It should be a traffic-stopper on the road tho. The teaser video featured a stripped down Roadstar and a Raider. Looks like they couldn’t elude a bullsh*t product name and marketing campaign. What might sell is the new 1900 motor with ABS in a bike less than $17,000. This won’t sell when you can get an American bagger for the same $$$. Buyers of this will get killed on the resale. Not as sleek or as good looking as the F6b, but probably more comfortable because it’s got more leg room. Echoing others, I would also like a version without all the distracto-tech infotainment bu11sh!t. I had the F6B, it was horrible and resale was the worst! New BMW bagger will kill Honda’s and Yamaha’s offerings. No mention of Cruise Control or self-cancelling indicators. I like that style of motorcycle, why do es Yamaha not make a modern one instead of a Harley retro clone? It could have been much lighter, nicely styled, water cooled and so forth. I don’t care for “Infotainment” either. Air cooled? Let me guess, push rods. 130 torques, 62 HP. Just like Harley. Does it have immense heat burning your legs? Just like Harley? I had a Roadliner with a chip & pipe and it put out 95 HP and 117 ft lbs at the rear wheel. I like this bike, it’ll turn heads for sure. Why does that word “infotainment” make me throw up a little bit in my mouth?